My ten year old son has gotten significantly into Civilization V lately, and we bought him his own copy on sale at Steam yesterday. So, he was at his mom’s house, and I was at my house, and he wanted me to invite him to a private match. In order to do so, I had to enable Assistive Devices, just like Steam has always asked players to do to help enable the overlays and multiplayer invite system. So I headed to the System Preferences, to the Accessibility preference pane, like always. Alas, there is no place there to click the familiar “Enable access for assistive devices” button. I looked high, I looked low. No dice. No enabling access for assistive devices, either. So then I turned to Google. A quick search turned up a post on TechRevue that explained where the assistive devices option had gone. Thanks, guys! 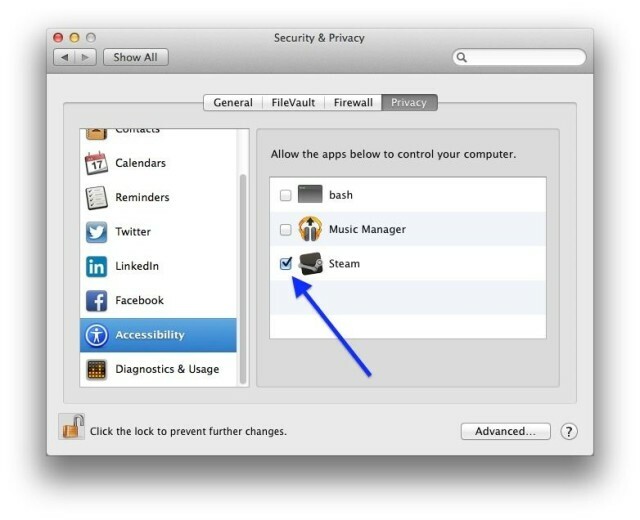 In Mavericks beta, you’ll need to launch System Preferences just like before, but then click on the Security and Privacy icon. Once there, click on the lock to make changes, entering your admin login info to do so. Click on the Privacy tab at the top of the window. Now, click on the Accessibility tab over on the left-hand side of the Preferences window and you’ll see all the apps that require Assistive Devices to be enabled. The message above them says, “Allow the apps below to control your computer,” which is pretty misleading, but whatever. Click on the checkbox next to the apps you want to enable to use with assistive devices, like Steam in the screenshot above. Boom! Now you’re cooking with gas Steam. Once I did this, I was able to invite my son to a Civilization V game. And then? It had taken so long to figure this out, that he had to go. Sigh. Such is the life of a techno family.